Individuals looking to create virtual reality (VR) content can now try building a few projects that are part of an upcoming alternative credentialing program from Udacity. The online learning company, which offers free online courses as well as paid “nanodegrees,” is letting users preview its upcoming program for VR content creation— at no cost June 8 through June 11. 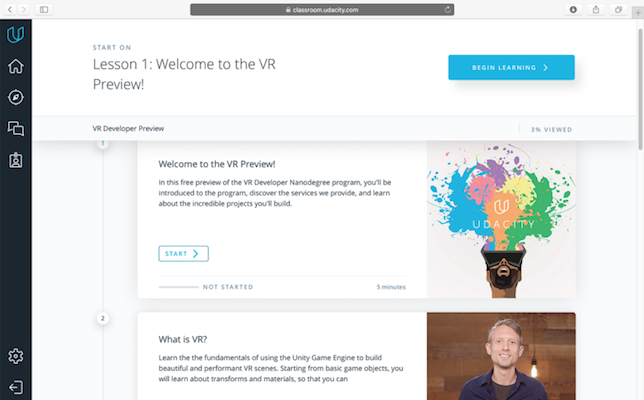 The VR Developer Nanodegree Program curriculum was developed in collaboration with Google VR, Unity, Upload, Unreal, Vive and Samsung, according to Udacity’s blog post announcement. It will be led by Christian Plagemann, vice president of learning at Udacity and co-founder of Google VR’s team and the Daydream platform, and will be taught by experts working in the field of VR content creation. The VR Developer Nanodegree Program uses a three-term program model that allows participants to enroll at their skill level. They can choose to start at Term 1 (titled “Foundations”) or Term 2 (“Essentials”), depending on skill level. “If you’re new to Unity, you’ll select Term 1. If you have a working knowledge of Unity as a game developer or digital storyteller, you’ll select Term 2. All students will ultimately advance to Term 3,” an overview of the syllabus states. Term 3 is where individuals get to specialize in any of the following concentrations: mobile performance and 360-degree media; high-immersion Unity; or high-immersion Unreal. The preview is available for free until June 11, after which participants may choose to enroll in the full program.